Kino's new Go West/Battling Butler Blu-ray compiles the two features that Buster Keaton conceived, directed, and starred in in, respectively, 1925 and 1926, immediately preceding his most venerated work, 1927's The General. But it is so evident in these films that silent comedy's "other" Master had already been developing his immense talent and skill for so long and had brought it up to such a high level of confidence and creativity, that there is no reason to consider them to be any less accomplished, inventive, or funny than The General, which, given the context of having seen the two preceding works, seems to have simply perfected, coalesced, and somewhat deepened Keaton's incredible cinematic gifts and comic personality. Fed up with his indigent life on the poverty line somewhere in the small-town Midwest, a young man identified in the credits only as "Friendless" (Keaton, of course) decides to cash in his meager belongings and drift by rail until he arrives in a more satisfactory, hospitable, and free environment. He discovers, after landing in New York and being thrashed about and nearly trampled to death in that town's sea of bustling crowds, that the hectic East Coast life is not for him. So, a statue of "Go West, young man" editorializer Horace Greeley symbolically superimposed over our rather more prosaic protagonist, he hops a train headed the other direction, disembarking in California ranch country. 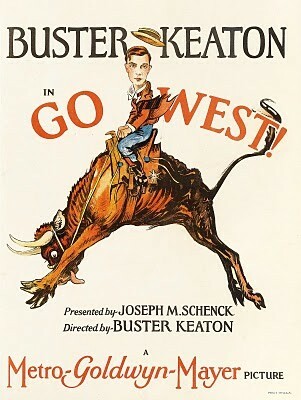 Miraculously stumbling his way into a job at a cattle ranch, donning a pair of chaps and trying to imitate the manly mannerisms of his seasoned fellows (watching Keaton affect a cowboy swagger is automatically funny), Friendless develops a special affection for a wide-eyed heifer that an intertitle introduces as "Brown Eyes." Brown Eyes saves Friendless from being gored by a couple of aggressive bulls; he attempts to reciprocate by protecting her from her impending branding. When a big order for a thousand heads of cattle comes through, Friendless finds himself in the unlikely position of having to wrangle the herd through treacherous territory to the stockyard, as a rival rancher has vowed to stop at nothing to sabotage the sale. More pressing than this daunting task, and even more urgent than whether or not the boss rancher's aloof, exasperated, pretty daughter (Kathleen Myers) will ever give him the time of day, is how Friendless will rescue his friend and ally, Brown Eyes, from her slaughterhouse destination. Keaton is, as one would expect, extremely charming in his famously deadpan way, and he taps every possible source of comedy in the film's situations, to which poor, hapless Friendless is, predictably, less and less adequate. These situations--the physically/comically ingenious unfolding of which is the film's real reason for existing, of course, much more so than the "story" they perpetually delay and disrupt--start out as inconveniences or obstacles for the character, then inexorably shudder and lurch toward sheer chaos, most extravagantly when Friendless and herd are diverted by circumstance through Los Angeles, where the confrontation of civilized urbanites with the sudden presence of barnyard animals on their sidewalks and in their shops plays out--with its multiple characters and circular, symmetrical comic payoffs, one gag following fast on the heels of the last--like a whole movie of its own within the frame of Go West. Keaton's gift for movement, for the choreography of comedy, is in full force here, sometimes even involving the camera in a strikingly modern way; there is a brilliantly subtle use of panning on which at least one gag hinges, and I usually do not associate the silent era with the kind of virtuosic dynamism Keaton displays when he gives us a stampeding bull's onward-rushing point of view as it runs down the endangered Friendless. 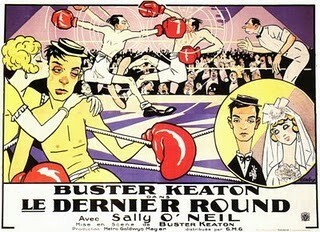 Watching all this well-orchestrated anarchy playing out so smoothly reminds us that a large part of this kind of "cartoonish" energy--Keaton's brand of pleasurably regressive, anti-realistic, chaos-seeking, visually comic style--got siphoned off into actual cartoons (e.g., Looney Tunes) once the talkies arrived. Friendless is in over his head from before the beginning and keeps sinking from there, but he never loses his clueless, persistent pluck, and we find ourselves rooting for ultimate unification and removal from harm's way for Friendless and Brown Eyes, who, by dint of being unique in their respective "herds"--both inferior and superior, misunderstood and extraordinarily sensitive outsiders--are two peas in a pod whose bond adds a lighter, sweeter grace note to what is otherwise an insane, frantic, compulsively laughter-inducing comedy. Keaton adapts Paul Girard Smith's stage play (a huge hit at the time, long-forgotten now) involving the forced, foot-dragging exodus of a young man, the Mr. Butler of the title, from his wealthy home after his father gets sick of watching him be pampered and coddled, and sends him out to the woods for a hunting and fishing trip that may "make a man out of him." (Oh, prescribed-and-enforced gender-role codes of yore, you never cease to amuse us!) Mr. Butler there meets (while dwelling in a tent containing more luxuries than most people's homes, and still being waited on hand and foot by his omnipresent, sycophantic valet (Snitz Edwards), the two of them fumbling about with dangerous, hysterical ineptitude with guns and other outdoorsy paraphernalia) a fetching young "mountain girl" (Sally O'Neil) whom he almost accidentally kills, but who becomes the object of his cleverly portrayed affection; a candlelit dinner throughout which the budding couple stares into each other's eyes and leans closer and closer across the hastily set-up card table ends with the table sunk in the mud of the forest floor, the two of them sprawled on the ground in the same transfixed, incongruously civilized position. The girl's country-fried father and brother, who seem huge compared to Butler (as did every other actor in Go West; all supporting players seem to have been cast with the requirement of having at least eight inches and 50 pounds on Keaton) and are the kind of "man's men" Butler's father wishes he could become, look askance at their girl's effete, spoiled new suitor, with the father exclaiming, in one of those pricelessly hyperbolic silent-comedy intertitles, "I don't want my daughter to be married to a...weakling!" 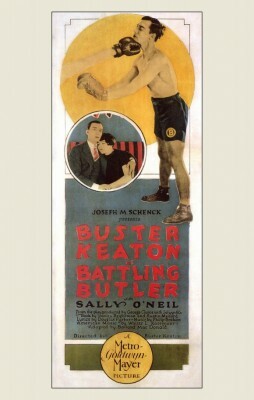 But all is not lost: The papers are full of news about a lightweight fighting champion who coincidentally shares young Master Butler's name, and the case of mistaken identity that ensues is utilized by Mr. Butler and lackey to add some instant, if completely false, tough-guy impressiveness to his persona. But can he pull off the masquerade, when it involves close-call, mistaken-identity run-ins with the man whose name he has stolen and, eventually, getting in the ring and demonstrating his famed boxing prowess against a fighter disconcertingly called "The Alabama Murderer"? Will the sudden new physical demands of actually becoming the champ he claims to be have the masculinizing effects on Mr. Butler that were the originally dictated purpose of his forced exile from hearth and home? And can the potential for true love between rich young Mr. Butler and his wildflower ever come to fruition under such false pretenses? A thousand hilarious misunderstandings, complications, and threats to Mr. Butler's heretofore well-assured physical safety ensue on the way to the film's lighthearted, unsentimentally romantic climax. The aforementioned dinner scene is only one of the film's bits of visual cleverness, which often serve to highlight and further the tender hope and fear underlying the central romance. The long scene in which Mr. Butler has to be dragged kicking and screaming into the ring for training in preparation for the big fight, for example, is memorably punctuated by the moment where Butler's beloved--who, as a stalling strategy in Butler's impossible charade, has been forbidden to observe him training or fighting--shows up anyway, and, in a beautifully designed shot, he spots her and she is framed, from his point of view and in a peculiarly compelling composition, by the massive crook in the elbow of the annoyed, hands-on-hips, musclebound trainer--a picture that really is worth 1,000 expository words. In another poker-faced-brilliant gag, Butler and his valet sit in an auditorium, literally petrified after witnessing a fight in which the "Alabama Murder" has amply demonstrated his savagery, as the rest of the audience files off. It's certainly funny enough already as the frame empties out around the two of them as they stare straight ahead, wide-eyed and aghast; a sudden cut to a very wide-angle shot, making the two of them look utterly forlorn in a vast world that has conspired against their little scheme, is even funnier, but also sort of melancholy. This is a usage of visual grammar more evenly distributed, more subtly finessed, more appropriate for the film's forays into the dramatic and even the emotional than what was already "working" so well as comedy in Go West. We do not have to wonder where Keaton went or how far he developed from there; the next stop and the logical aesthetic progression was to be The General.. Both Go West and Battling Butler are of a vintage (the 1920s) for which some visual flaws (from both the technical limitations of the period and the decades of wear, tear, loss, and neglect) are par for the course. However, Keaton's films, as part of a Library of Congress-affiliated restoration and preservation project, and as presented on Blu-ray here by the ever-conscientious Kino (in an AVC/MPEG-4, 1080p-mastered transfer at the original aspect ratio of 1.33:1), have had those flickering patches, lines, and scratches reduced to the lowest level possible, and though there are some quite scratched-up sequences, as well as a few revealing fairly severe print wear, everything remains clearly visible, and the flaws never even come close to being a distraction. This transfer is an excellent effort. 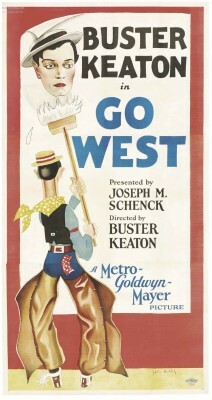 The films themselves are, of course, soundtrack-less, but Kino presents both Go West and Battling Butler with musical accompaniment (for the former, a synthesized orchestral score composed and performed by Eric Beheim; for the latter, a score composed and directed by Robert Israel). Each score is clearly meant to be a simulation (at least in tone and content, if not in instrumentation) of the live musical accompaniment of films during the silent era, and both work quite well and are pristinely recorded and mastered (almost incongruously so, given our awareness of the films' age) on the disc's uncompressed PCM 2.0 stereo soundtrack. The films are presented on the disc as two separate programs, each with their own extras. Go West's extras include a 13-minute, mostly unrelated short, also entitled Go West, which features a cast of trained monkeys playing out something like the striking-out-west story of Keaton's film. This is cute, very light stuff, and those monkeys can act (though contemporary viewers will notice the disturbing absence of a "no animals were harmed in the making of this film" disclaimer.) A 60-minute audio track features a rough, somewhat meandering, but fairly interesting recording from 1958 (when Keaton was 63, but still going strong in a show business that had shamefully left him behind) of Keaton and a scripting partner hashing out a proposal for an episode of TV's "Wagon Train." Finally, a stills gallery features some of the film's more striking images as well as revealing photos from some deleted scenes in which Friendless makes the additional mistakes of trying out the far north and the deep south before striking out west. The extras for Battling Butler include a 20-page excerpt from the screenplay for a proposed 1947 update of the film for the sound era (never made); a gallery of stills from a glossy souvenir book for the Battling Butler stage production's wildly successful stage run; and another featuring 20 or so stills taken from the film. Go West and Battling Butler are just two more gems in Kino's ongoing Blu-ray revival of the silent legend's filmography, and they look and sound terrific as they treat us to yet more of Keaton's cool genius; if we consider that these two technically/aesthetically adventurous, incredibly funny, surprisingly touching, completely controlled, and fully accomplished works form a trilogy at the climactic peak of which rests The General, Keaton looks more and more like a bona fide auteur and cinéaste ahead of his time. In his best work, his gifts as a filmmaker are ceaselessly passed along as gifts to us in turn, and this restoration compilation, carried out under the aegis of the Library of Congress, also belongs in the private Blu-ray library of anyone who cares about film history, is interested in the evolution of comedy style in the cinema, or just enjoys an effortless-seeming, well-inspired laugh. Highly Recommended.